15535kHz R Tamazuj in progress at 1510z tune in then nice ID right before music into R. Dabanga at 1528z. Here’s the recordings (longer one is Tamazuj going off). Only broadcasts Tues, Thurs, Sat & Sun best I can tell. Hope you like the recording of the 1st 90 secs (aborted by thunder claps in distance). This entry was posted in Clandestine on November 17, 2013 by fpeconsultant. Virtually all homebrew transmitters are crystal controlled. This is excellent from a stability point of view, but creates the difficulty of having to obtain the crystals. Usually this involves hunting around hamfests and swapmeets, hoping you’ll find a crystal of a suitable frequency. This can be hit or miss, especially for “out of band” operation, like 43 meters, where it is more miss than hit. I’ve done some experimentation with building my own Phase Locked Loop frequency generators, but the results were always dismal. I recently came across the CY22150 Programmable Clock Generator from Cypress. This single IC implements the PLL, divider circuits, and everything else. 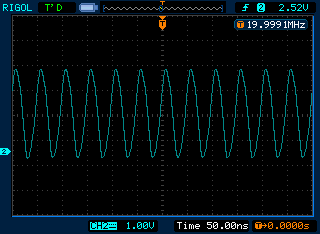 You just need a crystal for the reference (there’s a built in oscillator). And the crystal can be virtually any frequency. The CY22150 is in a TSSOP-16 SMD package, which is not very hobbyist friendly. I bought some of these adapters from eBay, which make the task of prototyping much easier. The CY22150 itself is available from Mouser and is $2.55 in single quantities. The CY22150 uses an I2C serial interface to configure the various settings. For my experiments, I connected it to a Raspberry Pi single board computer. You could bit bang the I2C commands out the parallel port of a computer as well, if you wished. The CY22150 can also be programmed using Cypress supplied software, so no I2C interfacing is required. I have not tried this, but it could be useful in cases where operation on only one frequency is required. First, after powering everything up, you need to enable one of the outputs. In my case, I am using Clock Output 1, so I need to set register 09H to a value of 01H. Second, I need to specify the source of this output. The datasheet refers to this as the “Crosspoint switch matrix control”, and the end result is setting register 44H to 20H, which tells the chip that we want the output to be DIV1CLK divided by DIV1N. 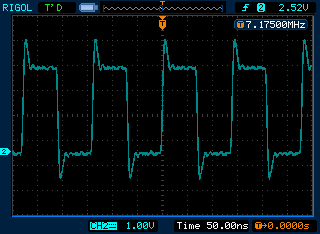 Third, we need to set the chip to use the internal oscillator with a crystal. In my case, a 20 MHz crystal. We need to set the oscillator gain level, based on the crystal frequency. Referring to the datasheet, we need the gain bits to be 10, and the end result is register 12H is set to a value of 30H. I played around with these values, and did not find them to be critical. Fourth, we need to set the input load capacitor control. These are equivalent to the small (10 pF or so) capacitors you connect to the crystal in an oscillator circuit. What nice here is that we don’t need any external capacitors, they are built into the chip, and we can select the values to use! 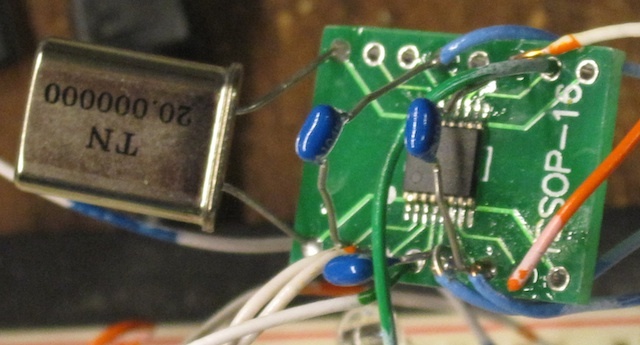 Register 13H sets the capacitor value. And, we can adjust their value to move the oscillating frequency, so we can get it dead on. 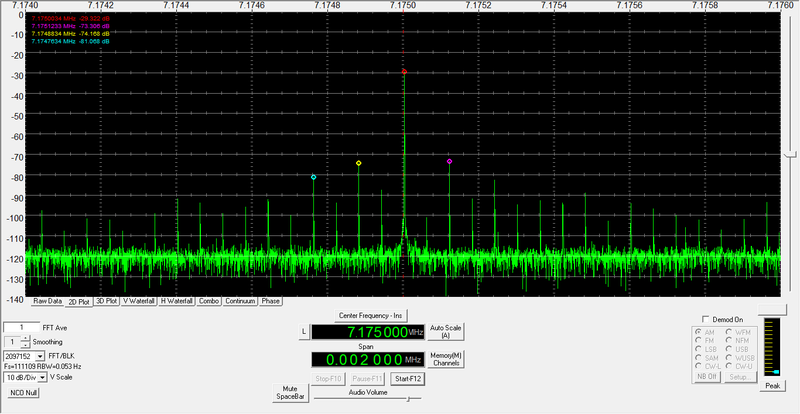 In my case, for a 20 MHz crystal, I needed to set register 13H to 8F. I finally get to use the screen capture mode of my Rigol scope! Now it gets a little hairy. We need to compute the divider ratios. The datasheet shows you how to do this. I found some source code on the net that calculates the values for you, as an iterative process. There are multiple divider ratios to produce a given output frequency, the code finds the best set and smallest frequency error. You call the program, passing it the frequency of your crystal, and the desired output frequency. It then goes through a few steps, and finds the best match. Ptotal (p) is the most confusing. We actually have to calculate what the datasheet refers to as PB and PO. The formula is P total = 2*(PB+4) + PO. In our case, we have 287=2*(PB+4) + PO. So PO is 1. Then we solve 286=2*(PB+4): 143=PB+4, or PB=139. That's 8BH. PB goes into registers 40H and 41H. The high two bits go into 40H. You also need to write three charge pump control bits into 40H, and set the two high bits of 40H. In our case, the two high bits of PB are zero. So we just need to set the two high bits and the charge pump bits. From the datasheet, we want to write C4H. We also need to write the low bit into register 0CH when we set the D divider ratio, below. The 8BH value we calculated above goes into register 41H. D goes into register 0CH. 50 decimal is 32 hex so we write 32H. Q goes into register 42H. PO goes into the high bit. You actually have to write Q-2 into the register, so we need to write 14 decimal, which is 0EH. Plus since PO is 1, we set the high bit, so we end up writing 8EH. Note that these values are based on a 20 MHz crystal. If you use a different value, they will be different. But that's the great thing about this chip, you can use whatever you have! As you can see, I do have a 60 Hz pickup issue to solve. No doubt due to the rats nest of wires. But... it works! Since the Raspberry Pie may be overkill for many homebrew transmitter applications, another possibility, besides programming the Cy22150, would be to use a inexpensive microcontroller such as a PIC to send the I2C commands to the chip. I may look into this as a future project. This entry was posted in Transmitters on November 14, 2013 by Chris Smolinski.